In this release we feature happiness, RA celebration, accessibility and OA, texting, Jason Griffey, and a new Federation. “Can public libraries make people happier and healthier?” John Pateman asks this provocative question in Libraries and Happiness, part of the Open for All? column. The research suggests the answer is “yes”! What should this mean for public libraries? “What could be simpler, connecting readers and books, right?” Perhaps. 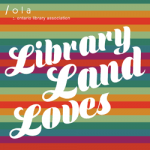 As Sharron Smith explains in OPLA’s Readers’ Advisory Committee – a 10 Year Reflection, it takes determination, organization, and core competencies; things the OPLA RA Committee has provided for a decade. Let’s celebrate 10 years of success! In the third part of her series on accessibility, Katya Pereyaslavska explores accessible open access. In Libraries as Publishers – Accessible Open Access Katya surveys developments in OA and offers some guidelines to MOTIVATE publishers. The askON virtual reference service has added texting to complement its successful chat facility. In askON Adds Text!, Jan Dawson and Siobán Linnen explain the initiative, why it is used differently by the students, and where it might go from here. Ever wanted to know more about the keynote and spotlight speakers coming to the OLA Super Conference in 2016? We did. And so Annesha Hutchinson is going to interview them …. in a fairly idiosyncratic way. Up this time is Jason Griffey, OPLA Spotlight Speaker. And finally a word from me, Organize! Influence!, about a critical development in the Canadian library community: the proposal to create a new Canadian Federation of Library Associations. If we want libraries to be heard at the national level, this is a crucial next step.